The Willows Care Home is designed to provide care for 30 residents; all bedrooms are tastefully decorated to give a relaxing feel. Bedrooms have 24-hour emergency call systems, private washing facilities, telephone and television points. All bedrooms are spacious and for single occupancy. Residents are encouraged to personalize their rooms, making them a true “home from home”. People may wish to relax in the comfortable and spacious lounge or day room, attractive conservatory overlooking the well tended garden. If the weather is warm enough, individuals can always take some fresh air and a cup of tea in the wheelchair accessible area to view our spectacular pond. Alternatively enjoy the two television lounges or the visitor's lounge for private visits. Going into a Care Home can be a very difficult time for both the resident and their families therefore life at The Willows is built around the residents. 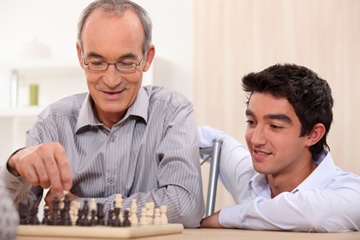 We support relatives as well throughout the duration of their loved ones stay. Visitors are always welcome and with notice to the kitchen, can join their loved one for meals. All residents are individually assessed both initially and ongoing during their stay at The Willows. This enables us to design a tailored care plan specific to that resident's needs and wherever possible with the support of their family. We place great emphasis in promoting independence by planning activities and exercises based on our residents personal needs. This helps stimulate people both physically and mentally. The Activities Coordinator at The Willows Care Home will at all times ensure that individuals are invited to join in events and activities that take place, along with friends and families who are also welcomed. We provide both in house and external activities such as arts and crafts, hand and nail care, one to one sessions, games, singers, music and movement, sing a longs and new ideas are always welcome! Full meals including breakfast, lunch, dinner, supper. We cater for special diets, and provide a range of beverages and snacks throughout the day. We serve excellent traditional home cooking with a varied menu. We pride ourselves in providing high quality nutritional meals, served in our formal dining room. There is a purpose-built laundry room on the premises, catering for residents laundry. The services of a visiting hairdresser is available weekly. Appointments can be made for a chiropodist, dentist or optician to visit whenever required. Delivery of personal daily/weekly newspapers and magazines can also be arranged (costs are not included in the weekly fee). Residents have a choice of doctors, dentists and opticians, as well as local GP's visiting the home whenever necessary. We can arrange visits from ministers, local religious leaders to conduct services as a whole or visits in private. If you are a carer, there will be times when you need a break but find it difficult to plan one into your busy life. Contact us to discuss how you can book your holiday in the knowledge that your loved one will be well cared for, giving you the peace of mind to enjoy your well deserved break. Please contact our Care Home Manager on (01778) 440773 - they will arrange a personal viewing. You can be sure of a warm welcome. My mother had a lovely time and we were happy to know that she was in a safe and friendly place while we were on holiday. I just wanted to say a big thank you to all at The Willows, for making my mums last months fantastic. I find it hard to put it in words the difference you all made. Thank you all you made a big difference to us and mum. We are forever in your debt. We appreciated so much the loving care we received from all at The Willows. Thank you to everyone for the way you looked after my father, once again thank you from the bottom of my heart. Dear everyone at The Willows thank you for making mums 90th very special with love. To all the staff thank you for looking after my sister and making her part of the family. Thank you to all the carers at The Willows, you cared with great affection and comfort. Received so much patience and Guidance during mums stay. Should we ever need a care home again we will be delighted to choose The Willows. Thank you for everything, especially the way Dad was treated with the up most kindness and humour. To all the staff at The Willows thank you for making us feel always welcomed, and for all what you do with the residents. To all the ladies thanks for the kindness and attention. Thank you for the loving care you provided.